The war on waste, in particular plastic waste, is raging here in Australia. Aside from asking for legislation change and demanding companies make kinder choices, I'm a big believer in leading by example to be a wonderful way to get people to move away from using single-use plastics. If people see others going about their day to day life, using reusable with ease, then others will see this, become intrigued and ask questions. I lost track years ago with how many instances someone has asked me or my husband about our reusable produce bags or why we are shopping with our own containers, instead of choosing the “regular” single-use option. I love that by using some of these very simple swaps in my day to day life has sparked conversations around refusing single-use plastic. Boomerang Bags are one of my favourite grassroots organisations helping to spark conversations in communities not just in Australia, but around the world. Just recently I saw they now have groups in Iceland! I am very excited to introduce them to you as part of my Changemakers series and I'll let co-founder Jordyn explain what it is they do in more detail. 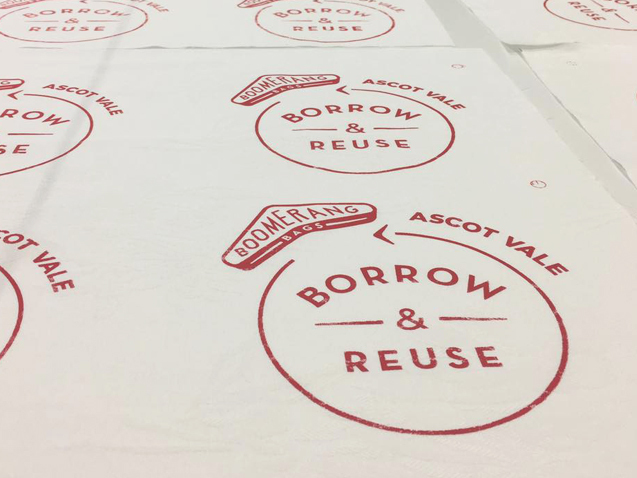 But in a nutshell, Boomerang Bags are cloth shopping bags sewn by volunteers from donated material and set up in stores for people to use if they forget their reusable bags. They then return the bags when they are next in the store. Before we leap into the interview I just want to say that I have met so many members of various Boomerang Bag groups and they are all legends. I don't just commend them for the time they give up to sew these bags. Rather it's the act of providing people with a sustainable choice no matter where they sit on the economic scale. 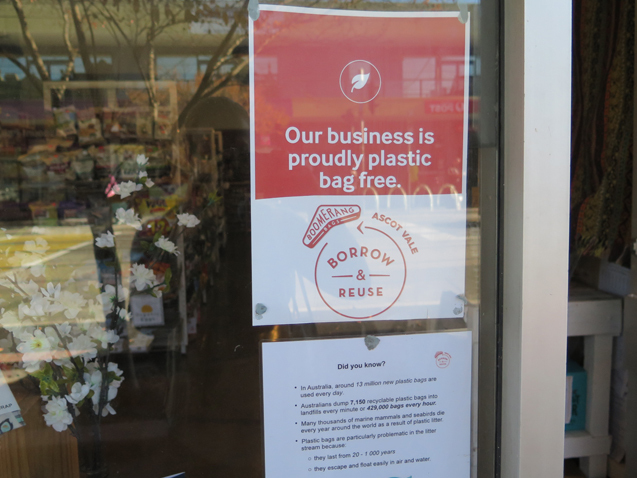 While the idea is for the bags to come back to the store after use, putting them out there in the community to use for free allows anybody to access a more sustainable option without having to pay money. It's a simple act of kindness. Not everyone has the money to spend on making the sustainable swaps many of us can take for granted. 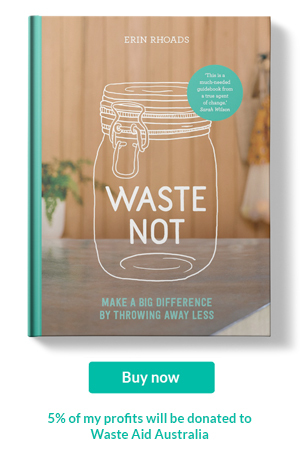 The whole community has an opportunity to feel included in this war on waste. This is just on of the many positive social impacts created by this grassroots organisations that goes beyond the environment. The two are interconnected after all, something worth remembering. 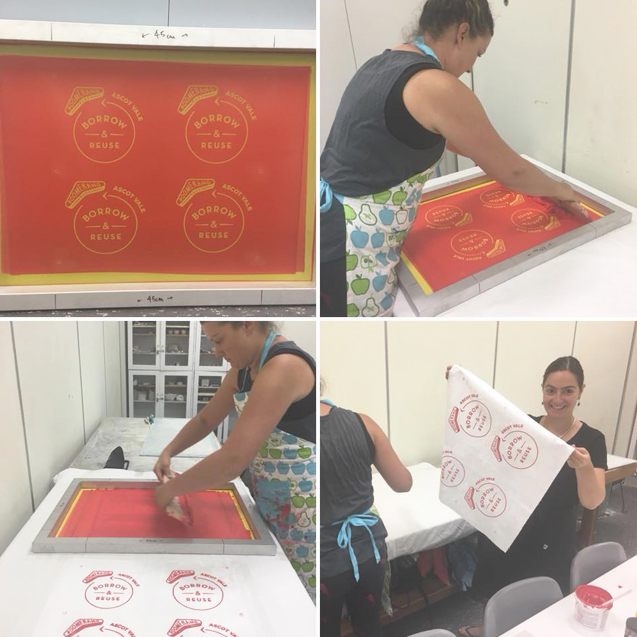 So I'm just saying thank you to all those Boomerang volunteers for your time gathering materials, cutting, ironing, pinning, screen printing and delivering the bags. On that note, if you are someone with surplus Boomerang Bags sitting at home that need to be returned don't forget to take them back either. Boomerang Bags is a grassroots initiative that works to foster sustainable behaviour change through positive, hands-on community engagement. We provide tools for people all over the world to implement a community program, making and circulating reusable boomerang bags as a sustainable alternative to plastic bags. 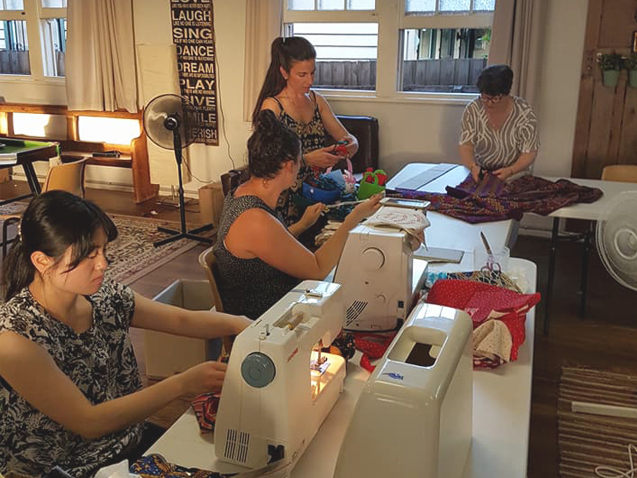 Dedicated volunteers and community groups get together to make the bags using collected recycled materials, and share them with the wider community. Through these activities we start conversations about plastic, up-cycle unwanted materials, build social connectedness, and ultimately empower people to take action to reduce the use of plastic bags (and other single-use plastics). 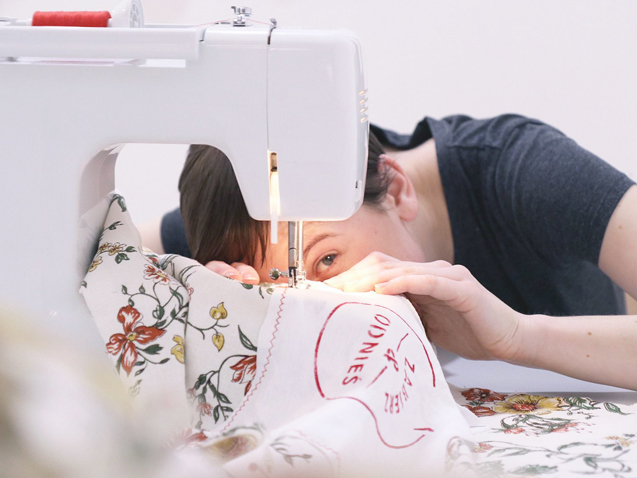 What inspired you to start sewing bags and giving them away for free? Being a surfer and ocean enthusiast, its impossible to ignore the impact that plastic pollution is having on the environment. The more educated I became about the issue, the more motivated I was to do something about it. Tania (the other co-founder) and I met and started brainstorming solution-based activities that could be implemented in our local community. As a teenager I worked as a checkout chick at Woolworths, which is where the plastic-free journey began for me. So plastic bags seemed like a good place to start - and we wanted to provide reusable bags to customers and businesses in our local area so that there was no barrier for them to get into the habit of using them. We were unable to find an Australian (let alone sustainable!) manufacturer, so thats where the idea of sewing the bags using donated, recycled fabric came in. Neither Tania or I are sewers, so we had to call upon help from friends and the local community, for material donations and volunteers to sew. After a few local bag-making events, and a huge amount of support from the local community, we realised how powerful this aspect of the project was in achieving a positive impact, both environmentally and socially. We provide tools for people all over the world to implement a community program, making and circulating reusable boomerang bags as a sustainable alternative to plastic bags. Dedicated volunteers and community groups get together to make the bags using collected recycled materials, and share them with the wider community. With over 500 Boomerang Bag communities across the world, are you surprised it has spread so far? Why do you think it's gained popularity? In the beginning we certainly didn't anticipate that boomerang bags would evolve in the way that it has, though we’re stoked with how far it has spread so far. I think part of its effectiveness is that its social, positive and fun, and that it provides a platform for people to be part of the solution. Plastic pollution is one of the biggest threats of our time, and with more and more research coming out about its negative impacts, it can be easy to feel overwhelmed and somewhat helpless. Humans are naturally driven to contribute to society, or ‘the greater good’ in a positive way, and projects like boomerang bags make it easy for people to do so. Everyday we are surrounded by media and advertising that suggest we should be living a certain way. It helps to be part of a collective that is breaking free of old social constructs and shifting towards a more sustainable way of life. What are some of Boomerang Bags achievements so far? So far, boomerang bags is now active in around 700 communities globally. Thousands of volunteers have collectively made over 200,000 reusable bags, which equates to around 60,000kilos of material waste diverted from landfill. I think the biggest achievements though are the ones that cant be quantified... the social connections, friendships made, and the conversations had as part of movement. Everyday we receive stories about the social benefits of being involved in boomerang bags - people learning new skills to help them find employment, immigrants and refugees integrating into the community, grandparents passing on life skills to their children and grandchildren, people finding their way out of depression through a newfound sense of purpose, and of course those ‘ah-ha’ moments, where people discover how simple (and fun) it can be to cut out plastic waste and live more sustainably. Whats cool about boomerang bags is that it appeals to many demographics, whether driven by their passion for the environment or their love for textiles and crafts, and while volunteering, people meet new people, share their stories and ideas, and inspire each other to do better in their everyday lives, from cutting down on plastic and other waste, consuming less, sourcing sustainable foods and other products, to eating less meat. The ripple effects are immeasurable! A store in the Melbourne suburb of Ascot Vale advertising they use Boomerang Bags. 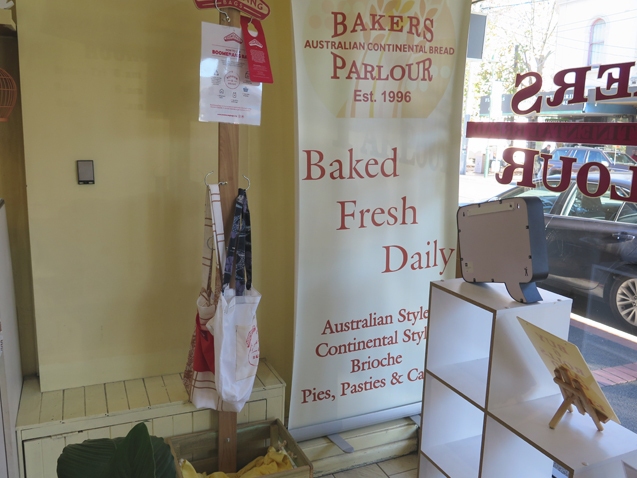 Bakers Parlour in Ascot Vale with Boomerang Bags. The tree and box will be topped up with bags sewn by the local Ascot Vale Boomerang Bags group of volunteers. And what are your plans for the organisation in the future? We hope to see the initiative continue to spread into communities around the world! Starting a grassroots organisation like Boomerang Bags has it's challenges, what were yours? How did you overcome them and what advice would you give to others wanting to start their own community driven environmental organisation? We didn’t necessarily plan for Boomerang Bags to grow outside of our local community at first, so as it grew there were challenges in trying to keep up with the demand. As an environmental scientist (myself) and a pilot/mum (Tania), we were suddenly thrown into the deep end of setting up an organisation and everything that comes with it…website development, graphic design, social media, volunteer management, content writing, partnership management, accounting. Luckily, we were blessed by so much support from the community to help navigate through and learn what we needed to (which is ongoing!). In terms of advice? Ask for help - there are so many people in the world with specific skills that want to contribute. Don’t be afraid to fail. Sometimes failing is the fastest way to learn! 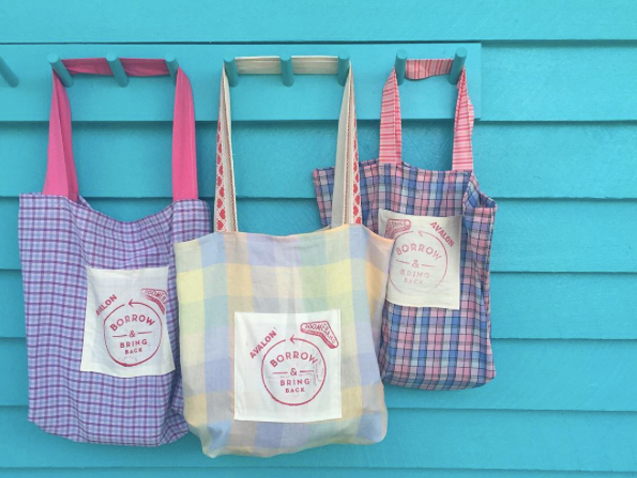 What are Boomerang Bags top tips to cut back on plastic? Start with one thing, be it plastic bags or other single-use items like straws, then move onto other areas one step at a time (bulk food shopping, etc). Have fun with it…see the plastic free journey as an adventure, rather than an inconvenience! Everything you do (or don’t do) makes a difference in the world. To start your own Boomerang Bags or join an existing group in your area visit the website.